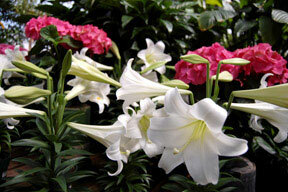 Payne’s Easter lilies are full, fresh and fragrant indoors and can be planted outdoors after May 15. With its beautiful trumpet-shaped blossoms, the Easter lily is said to symbolize purity, hope, and life, the spiritual essence of Easter and all the promises of spring. 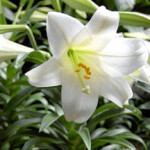 Today, despite a sales window of only about two weeks each year, Easter lilies are the fourth largest potted plant crop in the U.S., ranking among poinsettias, mums, and azaleas as America’s favorite blooming plants. 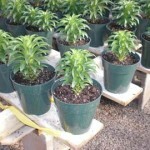 The photos on this page show the growing progress of Payne’s lily crop. Depending on when Easter falls, there will be more or less natural light available in the greenhouse which affects when the bulbs must be planted, daytime and nighttime temperatures, and how much artificial light or cooling darkness may be needed. 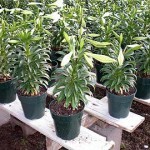 Lilies need about a thousand hours of cool, moist conditions to initiate blooming. 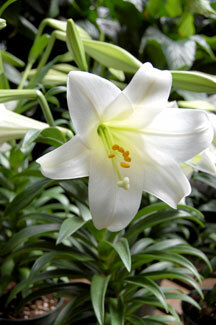 Growing lilies is a complex process because the date of Easter changes each year. Easter lily blooms last longest indoors if given bright, indirect light and cool (40-50ºF) temperatures at night, and daytime temperatures below 70ºF. Keep the soil consistently moist but never soggy and never let the pots stand in saucers of water. Lilies can also be planted outdoors to bloom again next year. Here’s how: After the flowers fade, keep watering the plants regularly and feeding them with any standard house plant fertilizer (Payne’s many types to choose from). The leaves will eventually turn yellow and die. Cut off the stem at soil level. Flowers have appeared so Easter can’t be far away. After May 15, plant the potted bulb outdoors in partial shade in a protected area. 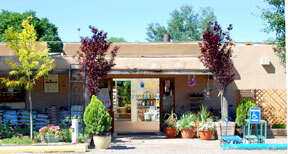 They need deep, rich, well-drained, composted soil—half-barrels work great! Mark the spot where the bulb is planted with a stake. Feed twice during the summer and add mulch in late fall. 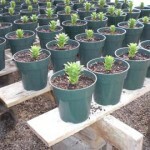 The plant should put up new growth and bloom next year in late spring or early summer.This same planting technique can be used with other potted bulb plants such as hyacinths, tulips and daffodils. Lilies in all their glory, ready to celebrate Easter. Gift wrapping and local delivery are available.